Yesterday one of the best independent analysts, Horace Dediu (highly recommend his Asymco Airshow) posted a few interesting charts regarding Internet population and how it relates to Google revenue. 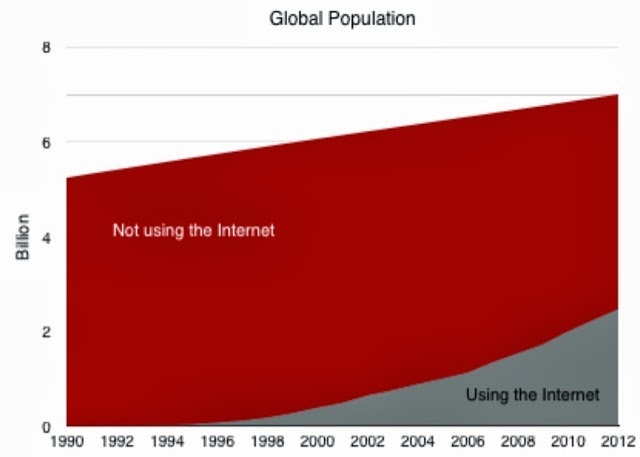 First, internet population vs non internet users. When I first saw the internet user vs non user chart I immidiately thought of poverty levels. As of 2010, the World Bank estmates Global poverty (those making less than $5/day) is around 4billion! Four billion is an insanely high number, and the regional leaders need to do better. But their efforts are partially limited by Global GDP growth. More economic growth more get lifted from these arbitrary poverty lines. The general thesis for Google is that the more people online, the better for Google's revenue. But the 4 billion living below $5/day become relevant to Google as they rise from the poverty line. In order for that to happen, the world needs economic growth in the regions. As of 2012, the global population stood near 7 Billion people. There are 4 billion living below $5/day, that leave 3billion people. Coincidentally, the number of internet users. The exponential adoption of the internet, relevant to Google (advertisers who want to target users with disposable income), has already peaked. 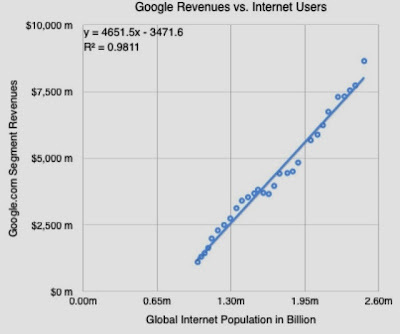 The growth remaining in Google, if subscribing to internet user/Google revenue relationship, is dependent on Global GDP growth. Obviously, Google is a bit more complicated, and dependent on Realtime-Bidding, video and their other initiatives. But the breakdown of these are for another post.